For generations, we, Iranians, have been using this aromatic fruit for its many health benefits and its unique flavor. From the quince Dam-noosh or herbal tea to heal our nervous system, to quince jam and to the savory quince and apricot stew. 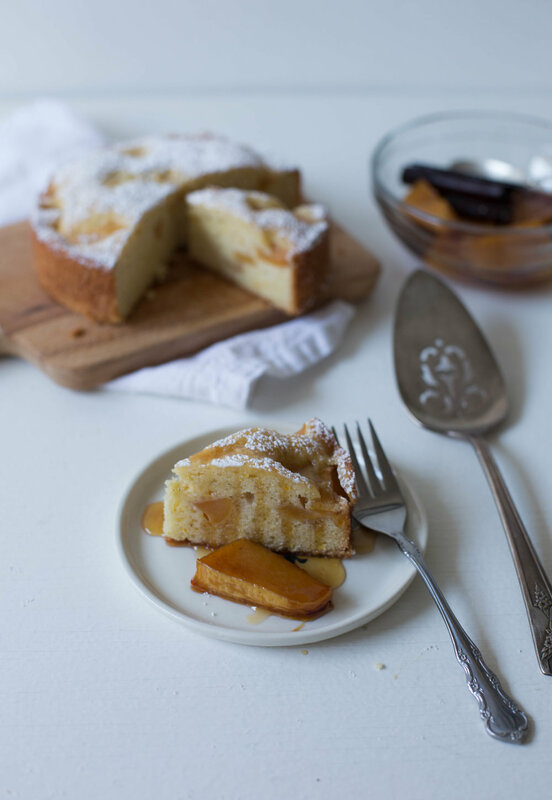 Quince is a hard fruit, much harder than apples, so I couldn't just chop and add to the cake batter. So I decided to cook the quince until tender, then add to the cake batter, which worked like magic. The other problem was that I mixed the chopped quinces to the whole batter, but after bake they sank to the bottom and it was hard to release the cake from the pan. So, I added a layer of the batter at the bottom, then chopped quince, and finished with another layer of batter. This time worked perfectly. Now, I hope you enjoy this recipe as much I had fun perfecting it. You can watch the process of making this cake on my Instagram highlights. 1. In a saucepan, combine the brown sugar, cinnamon sticks, cardamom pods, orange zest, orange juice and water. Place over medium-high heat and cook, stirring, until the sugar dissolves. Add the quinces and bring to a boil. Reduce the heat to medium-low and simmer until tender when pierced with the tip of a paring knife, 45 to 60 minutes. Let the quinces cool in the syrup, then transfer to a cutting board and cut into 1/2-inch dice. Strain the syrup and set aside. 2. Preheat an oven to 350°F (175°C). Spray a 9-inch (23-cm) round cake pan and cover with parchment paper. 3. In a bowl, whisk together the flour, baking powder and salt; set aside. 4. Using an electric mixer, cream together the butter and sugar on medium speed until light and fluffy, 3 to 5 minutes. Add the eggs one at a time, beating well after each addition. add cardamom powdered. 5. Using a rubber spatula, fold in the flour mixture. Pour half of the batter into the prepared pan, place a layer of chopped quince, and pour the rest of the batter, spread evenly. 6. Bake for 35 to 40 minutes or until the tester comes out clean. Let cool on a wire rack for 10 minutes, then remove the cake from the pan and let cool completely on the rack. 7. To serve the cake, dust the top with powdered sugar and drizzle with the reserved syrup.